Dies R Us: Hello Coffee! Hello Coffee! and Hello to the new design team members you will be meeting next month. As for me, this marks my last post as a Dies R Us Design team member. I have greatly enjoyed my extended stay on the team. It has been a pleasure to create with the wide variety of brands in the STORE . I have been introduced to some fantastic designers to which I will be loyal to for years to come. 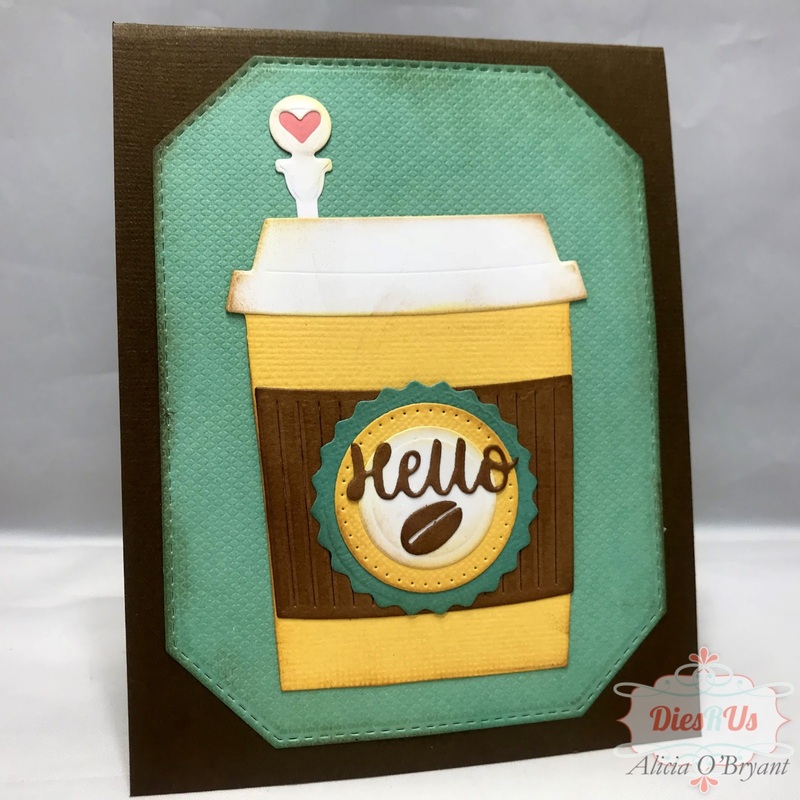 I am also very excited about all the "other" products I have recently purchased such as Distress inks and the very helpful Tutti Designs Poke Tools. Thanks to the Dani, Darlene and all the DT members for a great run! Today I am using my latest purchase the Karen Burniston Coffee Cup Pop Up dies. I find these pop up dies to be fairly easy to assemble, however, I always find a video to watch before I attempt it myself. You can view Karen's own video or find another version. I usually watch two to catch all the nuances of a new complex die. I found the actual mechanism of this pop up to be very different from others I own. It is really neat and allows a place for a gift card. 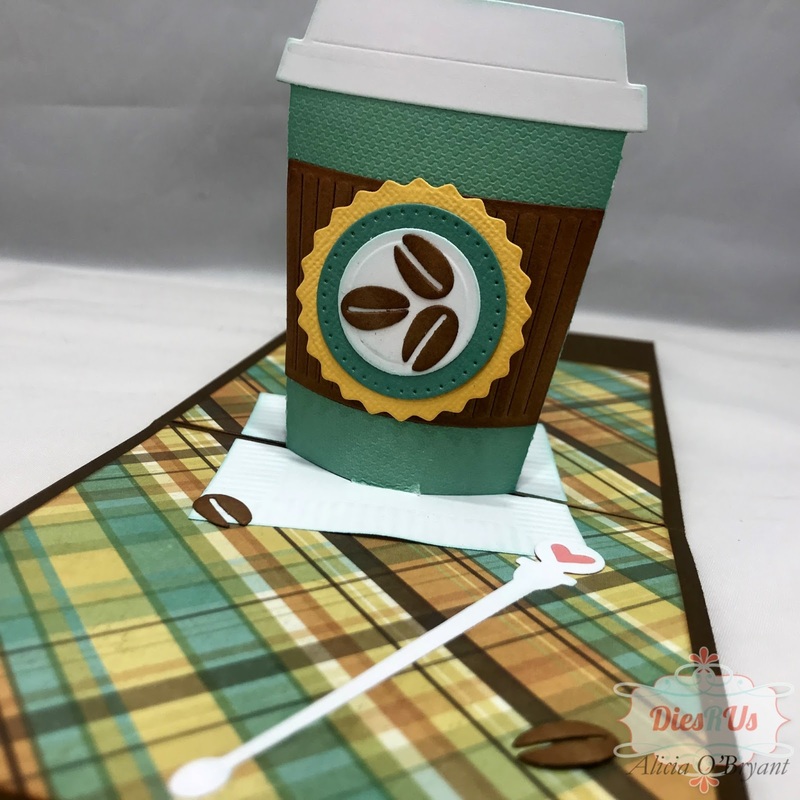 I did not plan on using this as a gift card holder so I centered my coffee cup, but you can place this pop up mechanism where ever you desire on the fold. It is awesome! Here's a closer look at my cup. The napkin the cup sits on has some really neat embossing that is hard to see in the picture. I tried to highlight it a bit with ink. I used only dies that came in the set except the Karen Burniston Greetings Hello and the Frantic Stamper Stitched Cut Corners background for the front of the card. Thanks so much for stopping by and I hope to see you all around in blogland! This is super cute Alicia! 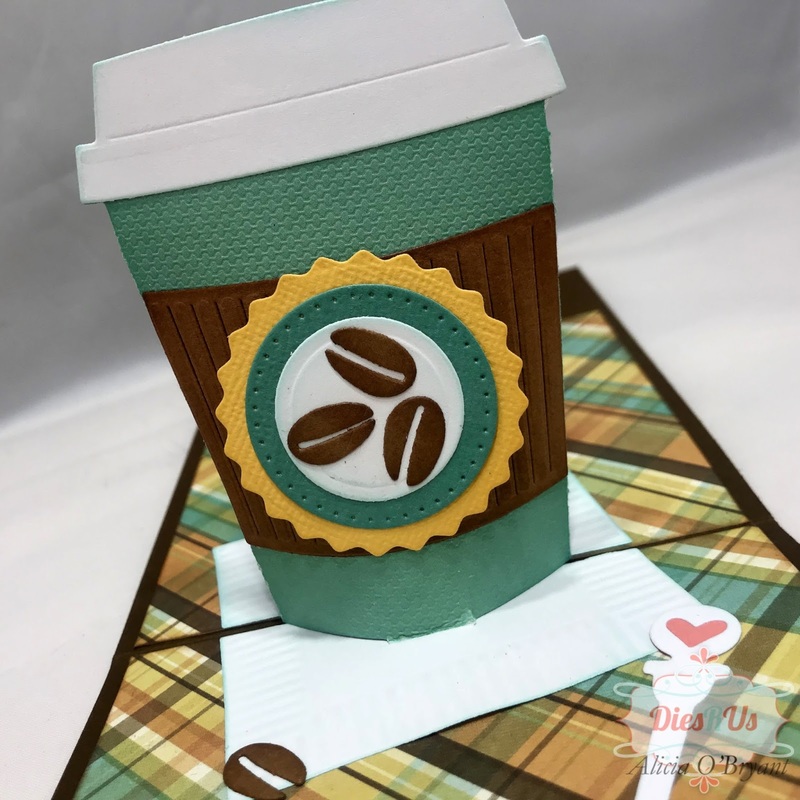 I love the pop up and that fab to-go cup. Awsome color palette too! What a cute card, love the pop up. You will be missed and so will your cards. Oh Alicia, it has been a real pleasure getting to know you and have you on the team! I have watched your designs flourish over the past year and you, my dear, are going out with a bang! THIS IS AWESOME!! I'm terrible with these sort of dies but you have inspired me to give it another go! I Love This!! Great job and please ... don't be a stranger!! Thanks for all the amazing inspiration! Love this and your perfect Designer Papers, that plaid is fantastic! Awesome card, you have used those dies perfectly. I LOVE the colors you have used, especially the plaid. Sorry to see you go, hope we see you around cyberland!!! What a great card! 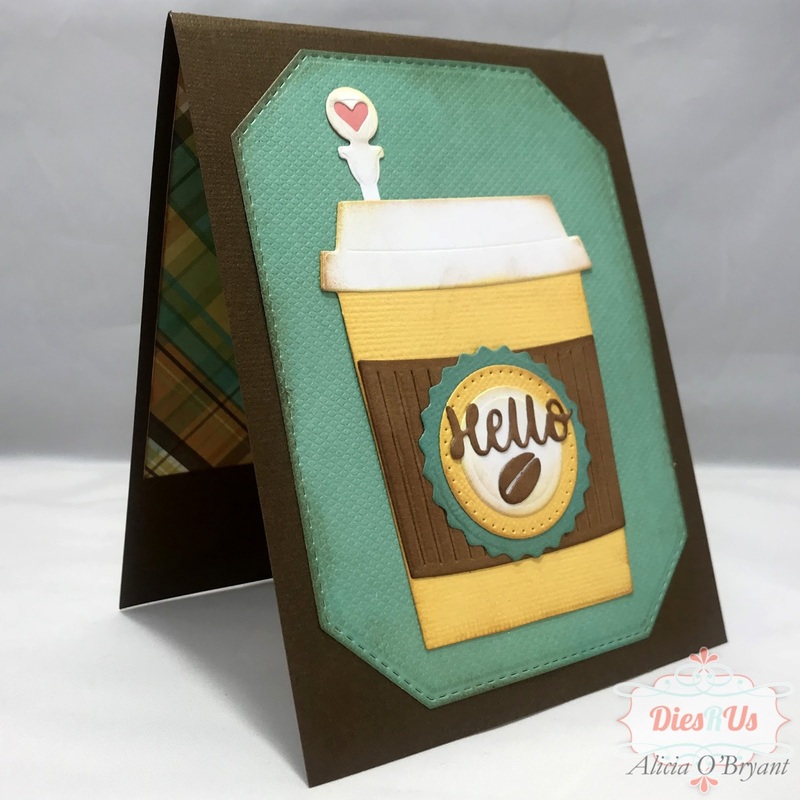 I'd like it first thing in the morning please :-) Love the colours you used and the pretty papers. This die is going on my wish list. It's been awesome being on the team with you Alicia.